‘Get Out’ is the debut film of writer and director Joran Peele, who is perhaps better known in America as half of the hilariously sharp and fiercely intelligent act ‘Key and Peele’. Having ended their show both have drifted in two different directions, with Key moving towards acting and can currently be seen starring in the new Netflix series ‘Friends from College’. Peele’s ‘Get Out’ quickly became a hit both critically and online with the name appearing nearly everywhere you looked. The film follows Chris Washington (Daniel Kaluuya) as he and his white girlfriend Rose Armitage (Allison Williams) visit her parents isolated country house. Described by some critics as one of the most important films of the year, and an inventive American horror film by others. The hype surrounding this film grew substantially over time and its DVD release this week meant I finally able sit down and watch it, and as a fan of horror I was incredibly excited. The film’s opening is remarkably intelligent, with a particularly memorable scene involving a white car playing the ominous ‘Run Rabbit Run’ song whilst stalking a black man in a suburban neighbourhood. The scene perfectly sets the tone of the film as an examination of society, culture and race. Like any good crime thriller/horror film, the start carefully lays out the blueprint, providing you with just enough information to begin speculating theories, whilst withholding certain details that would enable you to see the entire picture. Certainly the horror elements are all present and correct with the beautiful couple, the isolated house, the use of an animal, a few jump scares, and a feeling of unease the moment we leave the safety of Chris’s apartment. As previously mentioned, race is a prominent theme, one which is highlighted by Chris asking Rose whether she has told her parents that he is black, and whilst a question of that nature should come across as abnormal, it is instead quickly justified during a confrontation with a policeman where he is asked to provide a driver’s license despite not being the driver. This is not the confrontation we have sadly come to expect from US police officials, for as Chris begins to oblige Rose intervenes by questioning the officers intentions and quickly puts an end to the conversation to which Chris, who has been smirking background, begins to openly laugh as the two drive away. Peele uses his character’s dialogue and reactions through the film to highlight the many difficulties between the two cultures, and the friction that exists in parts of the world between overly black and overly white societies, cleverly evidenced by scenes shown throughout the film. This is made apparent by the character Rod (LilRel Howery) who acts as the outisde black community representative when on the phone with Chris, exposing a striking contrast with the overly white Armitage world. Upon arriving at the Armitage household, we are greeted by Allison’s parents Dean (Bradley Whitford) and Missy (Catherine Keener) a neurosurgeon and a hypnotist, and a place where the Stepford wives would probably feel quite welcome. The house is beautiful, isolated and impeccable, the makings of a classic horror situation, but more important are the members of the household staff, all of whom are black, which is commented on by Dean as being something he dislikes, hating the stereotype. Though he does attempt to redeem himself and connect to Dean by assuring the young man that if he could have, he would have voted for Obama for a third term, a moment that feels less like acting and more just Bradley Whitford caught in casual conversation. The entire structure and design of this set up not only provides you with clues regarding the rest of this horror/mystery film but also perfectly positions you alongside Dean, propelling you both into a sense of unease and speculation. When Rose’s brother Jeremey Armitage (Caleb Landry Jones) arrives, things start to become stranger still. Though is it a credit to Peele’s writing that he is at times able to carefully place valuable pieces of information into casual conversation and actions, there are moments however where the nuisance of a situation is too obvious, so that it is at times hard to tell what is designed as subtly and what is supposed to be blatant. My frustration with this otherwise brilliant film is the twist, which although interesting and certainly thought provoking was not quite on par with what I was expecting owing the sheer level of hype. Perhaps this is owing to my own extensive knowledge of similar stories both through books and films but owing to Peele’s specific hints both in how the characters reacted and through the layered conversations, it was hard to reach a different conclusion. Having said that though, there were a few surprises later in the film that I had no way of anticipating because barring one conversation there were if any, hardly any hints. Peele is a fantastic writer and director, and for his first feature film it is terribly impressive, however having dropped one too many hints in both direction and script the answer was therefore before the reveal and sadly not only did it miss the beat but it jarred the rhythm and never quite managed to recover its composure. Peele’s influences for his creation are clear if somewhat annoyingly too closely connected, with scenes reminiscent to Trainspotting. The biggest influence would appear to be Black Mirror. A TV show created by a similarly intelligently minded Charlie Brooker, where each episode plays out a scenario where a group of characters live in a world not dissimilar to our own, but where technological advancements have resulted in humanities self-worth and moral compass continually slipping. Though Peele’s examination is through medical advancements rather than technological, his exploration of a somewhat reversed liberalist perspective is highly interesting and evocative, viewing black culture as the latest trend in the market. 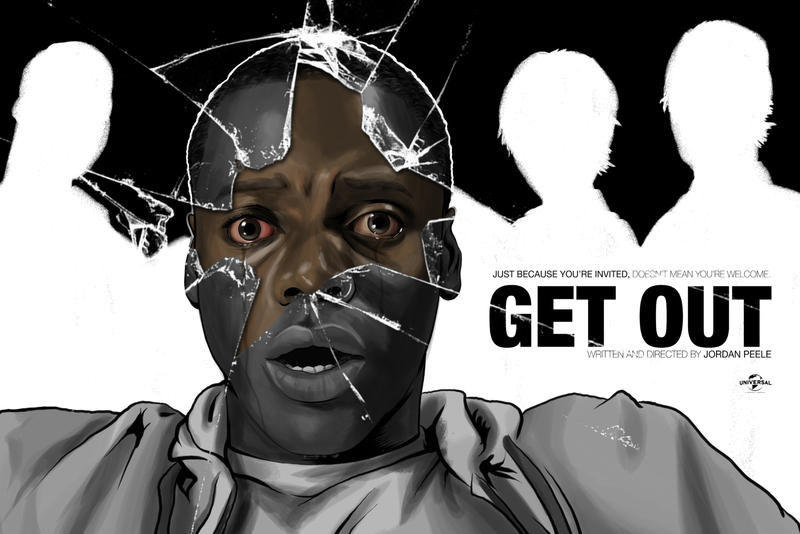 OVERALL **** Intelligent, provocative and with a terrifyingly brilliant cast of victims, ‘Get Out’ is a strong first step for Jordan Peele, though perhaps next time go lightly on the bread crumbs. RECOMMENDATION – Worth watching as a solid addition to the horror genre and one that requires multiple viewings.